This card's name becomes "Harpie Lady" while it is on the field or in the GY. You can discard this card to the GY; add 1 "Harpies' Hunting Ground" from your Deck to your hand. Of all the Field Searcher monsters, Harpie Queen is the only one that doesn't have the background of the Field Spell that it can search. Harpie Queen has the highest ATK for a card that is treated as Harpie Lady. Though there are other cards with the effect to change their name, this is the first one to have its name treated differently while it is in the Graveyard. For some reason, Harpie Queen is depicted such that there is only 1 visible talon hand (as the end of the other wing goes off the edge of the card). In Duel Terminal, you do see two full wings, and both have a talon hand. In Duel 018 of the Duelist manga, Mai Valentine referred to a group of powered-up Harpie Lady Sisters as Harpie Queens. This is likely coincidental, as they bore little resemblance to this card. This monster is featured in the artwork of The Big Cattle Drive and Alluring Mirror Spirit. If you have no "Harpies' Hunting Ground" in your Deck, you cannot activate the effect of "Harpie Queen". The "This card's name becomes "Harpie Lady" while it is on the field or in the Graveyard." effect is not treated as an Ignition, Trigger, Quick or Continuous Effect. This effect is treated as the effect of a monster. Therefore, if "Harpie Queen", "Harpie Dancer" or "Harpie Channeler" is treated as an Equip Card by the effect of "Relinquished", since it is no longer treated as a monster, its name is not treated as "Harpie Lady". (Their names are treated as "Harpie Queen", "Harpie Dancer" or "Harpie Channeler". ): If "Harpie Queen" is treated as an Equip Card by the effect of "Relinquished", is the name treated as "Harpie Lady"? The name of "Harpie Queen" is treated as "Harpie Lady" while it is in the Graveyard, and the names of "Cyber Harpie Lady" and "Harpie Lady 1" are treated as "Harpie Lady". Thus, if one copy each of "Harpie Queen", "Cyber Harpie Lady", and "Harpie Lady 1" are in the Graveyard, then you can use "Symbol of Heritage" to Special Summon one of them. 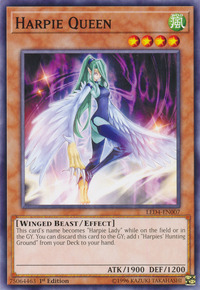 : If cards like "Cyber Harpie Lady" and "Harpie Queen" are in the Graveyard, then can you activate "Symbol of Heritage"? If "Skill Drain" is active on the field, while "Harpie Queen" is on the field its name will not be treated as "Harpie Lady". If “Prohibition” is activated choosing “Harpie Lady”, “Harpie Queen” will not have its name treated as “Harpie Lady” and can still attack and change its battle position.